A specification is a summary of the key points / issues, identified by your research and analysis. Your research should be in detail. Now is the time to draw all the research / evidence together, in a clear specification. The specification can be a list of key points / sentences, that help to determine the final design and development of the product. When writing a specification, refer where possible, to the research you have carried out. You could refer to specific research pages such as, the problem / brief page, the existing products pages, ergonomics and questionnaire page. You should consider including ‘quotes’ from your potential customers and / or referring to page numbers. Usually, each specification point is justified by referring to aspects of your research. 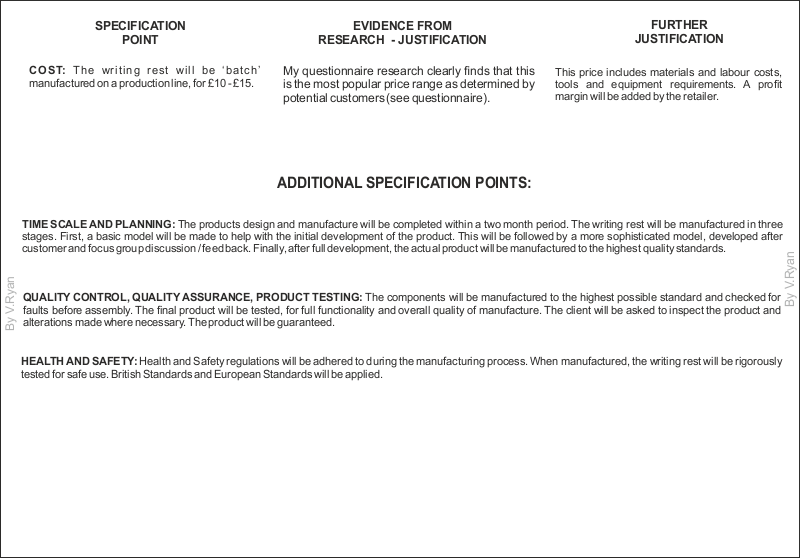 One way of setting out a ‘justified’ specification is shown below. In the first column a specification point is written as a sentence(s). In the second column, the point is justified by referring back to specific research findings. Further justification for each specification point, can be added in a third column. In the third column, there is no need to refer to specific aspects of research, as it can be a general common sense comment. 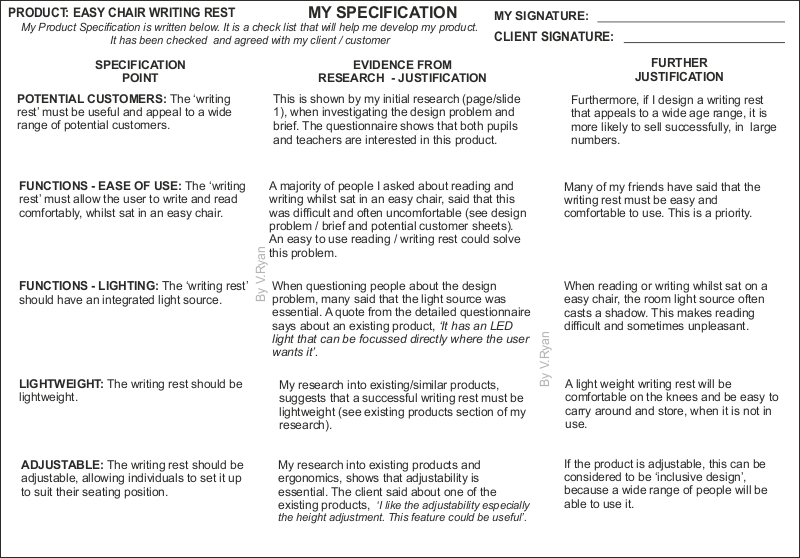 POTENTIAL CUSTOMERS: The ‘writing rest’ must be useful and appeal to a wide range of potential customers. This is shown by my initial research (page/slide 1), when investigating the design problem and brief. The questionnaire shows that both pupils and teachers are interested in this product. Furthermore, if I design a writing rest that appeals to a wide age range, it is more likely to sell successfully, in large numbers. FUNCTIONS - EASE OF USE: The ‘writing rest’ must allow the user to write and read comfortably, whilst sat in an easy chair. A majority of people I asked about reading and writing whilst sat in an easy chair, said that this was difficult and often uncomfortable (see design problem / brief and potential customer sheets). An easy to use reading / writing rest could solve this problem. Many of my friends have said that the writing rest must be easy and comfortable to use. This is a priority. FUNCTIONS - LIGHTING: The ‘writing rest’ should have an integrated light source. When questioning people about the design problem, many said that the light source was essential. A quote from the detailed questionnaire says about an existing product, ‘It has an LED light that can be focussed directly where the user wants it’. When reading or writing whilst sat on a easy chair, the room light source often casts a shadow. This makes reading difficult and sometimes unpleasant. LIGHTWEIGHT: The writing rest should be lightweight. 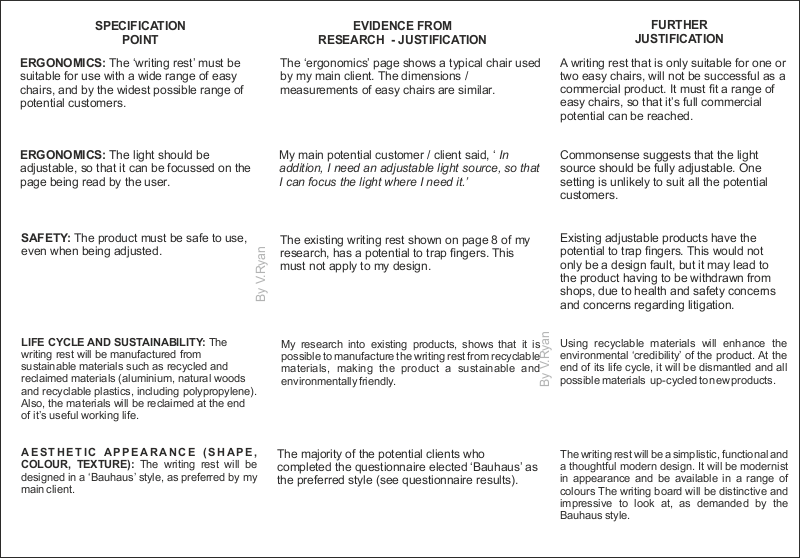 My research into existing/similar products, suggests that a successful writing rest must be lightweight (see existing products section of my research). A light weight writing rest will be comfortable on the knees and be easy to carry around and store, when it is not in use. ADJUSTABLE: The writing rest should be adjustable, allowing individuals to set it up to suit their seating position. My research into existing products and ergonomics, shows that adjustability is essential. The client said about one of the existing products, ‘I like the adjustability especially the height adjustment. This feature could be useful’. If the product is adjustable, this can be considered to be ‘inclusive design’, because a wide range of people will be able to use it. ERGONOMICS: The ‘writing rest’ must be suitable for use with a wide range of easy chairs, and by the widest possible range of potential customers. The ‘ergonomics’ page shows a typical chair used by my main client. The dimensions / measurements of easy chairs are similar. A writing rest that is only suitable for one or two easy chairs, will not be successful as a commercial product. It must fit a range of easy chairs, so that it’s full commercial potential can be reached. ERGONOMICS: The light should be adjustable, so that it can be focussed on the page being read by the user. My main potential customer / client said, ‘ In addition, I need an adjustable light source, so that I can focus the light where I need it.’ Commonsense suggests that the light source should be fully adjustable. One setting is unlikely to suit all the potential customers. SAFETY: The product must be safe to use, even when being adjusted. The existing writing rest shown on page 8 of my research, has a potential to trap fingers. This must not apply to my design. Existing adjustable products have the potential to trap fingers. This would not only be a design fault, but it may lead to the product having to be withdrawn from shops, due to health and safety concerns and concerns regarding litigation. LIFE CYCLE AND SUSTAINABILITY: The writing rest will be manufactured from sustainable materials such as recycled and reclaimed materials (aluminium, natural woods and recyclable plastics, including polypropylene). Also, the materials will be reclaimed at the end of it’s useful working life. My research into existing products, shows that it is possible to manufacture the writing rest from recyclable materials, making the product a sustainable and environmentally friendly. Using recyclable materials will enhance the environmental ‘credibility’ of the product. At the end of its life cycle, it will be dismantled and all possible materials up-cycled to new products. AESTHETIC APPEARANCE (SHAPE, COLOUR, TEXTURE): The writing rest will be designed in a ‘Bauhaus’ style, as preferred by my main client. The majority of the potential clients who completed the questionnaire elected ‘Bauhaus’ as the preferred style (see questionnaire results). The writing rest will be a simplistic, functional and a thoughtful modern design. It will be modernist in appearance and be available in a range of colours The writing board will be distinctive and impressive to look at, as demanded by the Bauhaus style. COST: The writing rest will be ‘batch’ manufactured on a production line, for £10 - £15. My questionnaire research clearly finds that this is the most popular price range as determined by potential customers (see questionnaire). This price includes materials and labour costs, tools and equipment requirements. A profit margin will be added by the retailer. In addition to specification points, derived from the research you have carried out, you can include other additional points. These could be general points, that would to apply to the design and manufacture of any product. For instance, you may want to refer to the timescale for completion of the project /product. Another important specification point may be, how you intend to ensure high levels of quality control. You may need to make a statement about meeting Health and Safety legislation. TIME SCALE AND PLANNING: The products design and manufacture will be completed within a two month period. The writing rest will be manufactured in three stages. First, a basic model will be made to help with the initial development of the product. This will be followed by a more sophisticated model, developed after customer and focus group discussion / feed back. Finally, after full development, the actual product will be manufactured to the highest quality standards. QUALITY CONTROL, QUALITY ASSURANCE, PRODUCT TESTING: The components will be manufactured to the highest possible standard and checked for faults before assembly. The final product will be tested, for full functionality and overall quality of manufacture. The client will be asked to inspect the product and alterations made where necessary. The product will be guaranteed. HEALTH AND SAFETY: Health and Safety regulations will be adhered to during the manufacturing process. When manufactured, the writing rest will be rigorously tested for safe use. British Standards and European Standards will be applied.